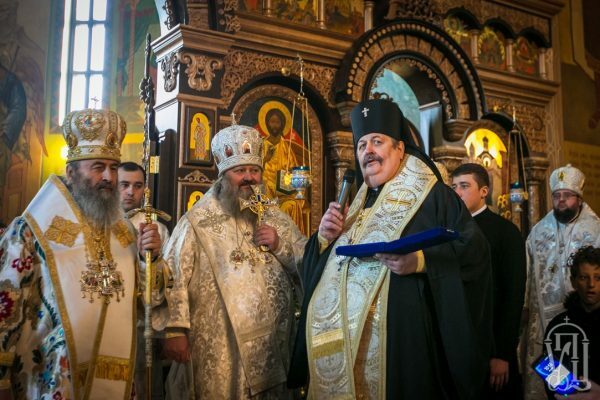 On 20 January 2019, after the Divine Liturgy at the Cathedral of the Protecting Veil of the Mother of God in the city of Borispol, Archbishop Abel of Lublin and Chelm expressed support to the Ukrainian Orthodox Church and its Primate His Beatitude Metropolitan Onufry of Kiev and All Ukraine, the UOC Information and Education Department reports. “The Lord has vouchsafed me today to participate with you in the Divine Liturgy, celebrated by His Beatitude the Primate of the Ukrainian Orthodox Church, Vladyka Onufry. I have the honour of knowing you, Your Beatitude, for over thirty years,” the hierarch of the Polish Orthodox Church said. Archbishop Abel also conveyed to all those present greetings from His Beatitude Metropolitan Sawa of Warsaw and All Poland. “Throughout its history, the Orthodox Church in Poland endured many ordeals. And today, standing at God’s Altar as a Synaxis of saints are martyrs of my diocese, hieromartyrs of the land of Chelm and Lublin. That is why, perhaps, we better than anyone understand the current situation of the Ukrainian Orthodox Church,” the Polish hierarch said.